Riccobene Associates Family Dentistry announces their acquisition of Highland Family Dentistry in Oxford, North Carolina. Riccobene Associates, based out of the Research Triangle region, is pleased to offer the highest standard of dental care to their new neighbors in the Oxford community. Riccobene Associates Family Dentistry, North Carolina’s premier multi-specialty dental practice, has announced their acquisition of Highland Family Dentistry in Oxford on January 2nd, 2019. 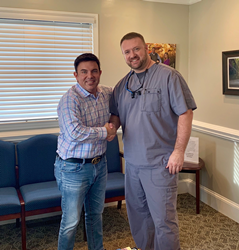 Riccobene Associates, based out of the Research Triangle region, is pleased to offer the highest standard of dental care to their new neighbors in the Oxford community at 111 East Industry Drive, Oxford, NC 27565. The Oxford office provides a comprehensive selection of treatment options including general dentistry, cosmetic, implant, surgery and restorative treatment. Riccobene Associates accepts dental insurance; those without dental insurance will have access to an affordable in-house dental membership plan and patient financing. Riccobene Associates Family Dentistry, founded in 2000 by Dr. Michael Riccobene, continues to focus on providing high-quality, patient-centered care through the use of state-of-the-art dental equipment and facilities. For more than 18 years, the company has earned numerous “Favorite Family Dentist” awards throughout the Triangle area in publications such as Cary Magazine and Carolina Parent. Riccobene Associates was named one of the 50 Best Places to Work in the Triangle last year and was recently recognized as a Fast 50 Company by the Triangle Business Journal. For more information or to request an appointment, please visit http://www.BrushAndFloss.com.